The only reason Alex’s birthdate is know is because that was all the information that was left on him when he was found by the ‘St. Ceallaigh’ Orphanage’s caretakers in early October of 2347 in Dungannon, County Tyrone, Ireland. He was only a few months by then. He was taken into their care and subsequently raised by the caretakers, because they couldn’t find him a foster home. From early on, he showed an uncanny linguistic talent, speaking German, Gaelic and Federation Standard by the time he was five. He was afforded moderate schooling, in accord with what the caretakers could afford, but Alex always knew it wasn’t enough for him. So, at fifteen he ran away from the Orphanage to Belfast and lived on the streets for the next five years, stealing, cheating, talking his way out of things. Inadvertendly, it had toughened him up and closed him off. When he was 18 his best friend was killed in a street fight, and he himself had almost died. It was then that he’d decided he needed to do something with his life. A Starfleet recruitment manual had come under his fingers while he was lying in hospital, recovering. It had come by way of a Starfleet Captain who was visiting a bed ridden colleague in the room with him. The Captain spoke with him at length that day about potential, morals and ideals. Young Alexander knew then what his course in life would be. He enrolled into a few preparatory courses when he left the hospital, found a job and worked hard to pass the exams. His aptitude tests and scores in preparatory courses fielded Alexander towards the sciences, mainly the social ones aswell as languages. He showed great skill in linguistics, sociology and xenosociology, psychology and xenopsychology and the like. These lead him to sit the entrance exam at Starfleet Academy in 2366. He failed on the first try, applied for the next one immediately and worked extra hard in the interim to make up for the mistakes done during the first exam. The second sitting was more successful and Alexander Night was admitted into Science Training with some of the specialized Linguistics courses in Operations. Nearly immediately after he graduated, he was approached by Commander Eron Weylin. The Commander revealed himself to be working with Starfleet Intelligence, and conveyed to him their interest in his skills. It had been a dream encounter for him. He would be able to combine his love of languages with his action oriented heart all the while doing something worthwhile, protecting the institution he dearly loved. It was the ideal of Starfleet and the Federation that kept him focused and rooted in reality, and now he had a chance to do something about it. So in 2370 he entered Intelligence Cross training. The first three years of his career were spent as an analyst in the Orion Section. It was during these three years that he has his first encounter with what would turn out to be a life long colleague and friend, Jack Lashmore. Lashmore was a Cadet at the time and facing a hearing by the Starfleet Academy board and probable explusion. The Cadet had also been profiled as a potential asset and slated for recruitment after graduation. What was unexpected was the fact that Night encountered a familiar face, one Commodore Timothy Richardson, brought in as an outside observer. It had been Richardson, a Captain back in 2365 that had talked to young Alexander in the hospital in Belfast, Ireland. Due to Lashmore’s background and his heritage, Night believed the Cadet was right in his actions during the Mars Hostage Exercise 3B. It was during that hearing that Night decided to proceed slowly with the desired recruitment. With Night’s vote and Richardson’s authority that Cadet Lashmore’s future career was saved. Following the hearing Nighthad a lengthy conversation with Lashmore and the two struck a handler-asset deal which would be picked up upon in the later years. Reassignment awaited them first. 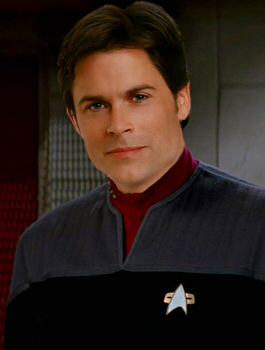 Lashmore would finish his Cadet cruise and Night would be assigned as Intelligence Officer to the USS Fenris, under Commodore Timothy Richardson. The two struck a friendship in their service on the Fenris in the next three years. With the Fenris nearly always on the front lines, such as the Torros III shipyard destruction and many others. The Fenris soon gained fame as the ‘old war horse’, taking a beating, patching up as best they could and getting back in the fight. It was during this time that the two struck a friendship/bond with fellow security officer, Riia Talani and a strategic operations officer, Sinara. Parting for them, after the war, when crew started cycling out had been hard, as the four had bonded deeply. Alex was reassigned back to Starfleet Intelligence, as a field officer in the Cardassian Section. It was irony or providence, Alex could never quite tell that had him back in contact with Jack a few months later after being reassigned back. The slot was up and Lashmore was to be offered a place among the ranks of Starfleet Intelligence. Much to Alex’s surprise and approval, Lashmore accepted. In the following year, Night assisted in Jack’s training and placed the younger agent on ‘as required’ duty following the end of the cross-training. As for Alexander himself, he spent the next two years on various field assignments and asset handling operations. Until 2378, when the Hellfire mission happened and Alexander’s rosy view of the Federation was forever changed. The assembled team, consisting of Jack Lashmore, Latisha Delreye, Riia Talani (who had also been recruited the year prior) and two others; was ordered to a remote fringe star system which was home to a remote listening station utilised by Starfleet Intelligence where a Borg scout ship had crash landed. The team was to secure the Listening-Post, and contain the Borg threat. Contain not eliminate – to combat the Borg was to learn from a living specimen, to combat assimilation was to have a living assimilated subject. Alex had been repeatedly warned by both Jack and Latisha that something was wrong, that the mission had started off too easy. Night stood firmly and foolishly by his orders. The mission went south fast, the Borg having seemingly adapted over a decade of encounters with humanity had released airborne nanites as a last ditch defence. Latisha was immediately infected and moments after two other team members also were. Alex dispatched of the two infected team members fast with Riia’s help and made to put Latisha, Jack’s lover out of her misery but was wrestled down by Jack, the man performing the deed himself rather than let anyone else do it. Once the three were safe in planetary orbit they detached their final countermeasure, a hellfire warhead…incinerating all life, and all Borg presence on the planet surface. Nothing was the same after that mission. His friendship with Jack declined, which he couldn’t blame the man for at all. In fact, he blamed himself alone. So, he threw himself deeper into work, started re-checking orders, doing better research, informing himself. He would never make such a mistake again if he could help it. It was during this time Alexander came into contact with Sinara again and the two struck a mentally and physically beneficial relationship for a time. The powers that be saw it fit to promote him to the Alpha Quadrant Powers section as it’s deputy commander of field operations. With greater power and responsibility came greater access, which allowed Alexander to continue his vigilance. He dealt with agents and assets along the Klingon border mostly, as well as turning several key figures within the Quadrant as Starfleet Intelligence informants. His path crossed Jack’s again in 2383 when the younger man returned to Earth to undergo Command and evaluator training. With their relationship strained, the assignments Jack performed for Alex required only minimal contact and even less conversation. The following year Alexander was yet again promoted and given the Romulan Sections Field Operations division. He had dozens of agents under his care now and double if not tripple the assets, contacts and informants. He had requested Riia Talani to be assigned to him as Deputy. The two would go on to have a good working relationship. It would be several years later when Alexander was reunited with Sinara and the two entered their liaison again, this time with more emphasis on companionship and feelings. 2388 however would bring change again. With the renewed entry of Starfleet Ships into the Raeyan Transit Corridor, an area under his purview, in Intelligence domain, the tensions in the area began increasing. Federation ships started getting attacked by so called ‘Free Romulan Movement’. Alex and Sinara, after a particularly dangerous mission in which they almost jeopardized fellow agents due to their concern for one another had decided to end their liaison because they did not want the job or others to suffer because of their mistake, though the two remained friends. One of the attacked ships was the USS Venture on which an agent from Counter Intelligence, known to both Alex and Sinara was placed under cover. To help stabilize the region, Alexander had reassigned Sinara to the Venture as startegic operations officer. On a diplomatic mission to one of the former romulan worlds in the Corridor said agent, one Linshara Thannis, was lead into a trap by a Tal’Shiar agent working on the planet. As it would later turn out, the romulan agent knew of Thannis’ role and identity before she even set foot on the planet, thereby revealing the existence of a mole somewhere within the ranks of Starfleet Intelligence. Given this incident and the attacks on the other ships, Night and Talani came under investigation and heavy scrutiny from Internal Affairs. While Night was not found guilty by intent, as head of Field Operations for the Section, he was none the less punished for apparent negligence in maintaining a better network and security of the Corridor. As such, he was in the end demoted to Commander and put on a ‘waiting for reassignment list’. Officially the investigation in the existence of the mole is ongoing. Night was eventually reassigned to the Starbase Kusawake which was spearheading the new Ashland Initiative in the Borderland, as the Intelligence officer for the region.